Each year, thousands of international students come to the United States to study at American universities. But before they arrive, these students all go through the same, sometimes arduous, process of applying for the necessary paperwork: the I-20 form and the F-1 (student) visa. It’s not an easy process, but it’s manageable—you just need to be prepared. It is important to first understand the financial commitment required for you to enroll in schools in the United States. The F-1 immigration regulations require all international students prove they can cover full tuition and living expenses for at least their first year of study. Barring unforeseen circumstances, similar funding should be available for the following years of study. The strict limitations on the ability of international students to work in the United States can be an obstacle to financing your education abroad as well. You need to be aware of the financial commitment and realistic living expenses required of studying in the United States. This need is even more pressing with the current worldwide economic situation. The U.S. immigration system is founded on the concept that individuals come either as immigrants (those who want to live in the United States on a permanent basis) or nonimmigrants (those who want to live in the United States on a temporary basis). Students are nonimmigrants, so you should be prepared to demonstrate that your stay will be temporary and that you will return home after completing your study. Indeed, the main reason worldwide why student visas are denied is due to students’ failure to prove they have a residence abroad they do not intend to abandon. To avoid this, you must be able to articulate how your study in the United States will contribute to your future goals and career in your home country. In order to obtain an I-20 form, you must submit a written application to the school, along with the appropriate financial documents that show you can cover full tuition and living expenses for at least your first year of study. (Remember, similar funding should also be available for the following years.) Then, you need to prove your language proficiency, typically through standardized tests such as the TOEFL or IELTS. Most schools have their own in-house application for students to submit too, and the length of time it takes a school to issue the I-20 depends upon the institution. The types of financial documents that are acceptable may vary from school to school as well, so it’s a good idea to check with your college or university if you have any questions regarding the documentation required. (Stay in touch with the office of international student services throughout this process. They are there to help you!) You should also apply as early as possible, allowing a minimum of two to four weeks to receive your I-20. The I-20 form is issued through the Student and Exchange Visitor Information System database, also known as SEVIS. This is the mechanism by which the U.S. Department of Homeland Security monitors the arrival, enrollment, and departure of international students and their dependents. The I-20 has a barcode and unique SEVIS ID number for each individual student; it also contains important biographical, academic, and financial information. Once you receive your I-20, you should check to make sure the information is accurate. (After reviewing it, be sure to sign Section 11, “Student Certification”!) You will need to arrive in the United States by the start date listed in Section 5 of your I-20. You can enter up to 30 days before this date but not after. You will also want to check with the admission office or your advisor to make sure you arrive in time for any mandatory orientation sessions. The next step is to pay the $200 SEVIS fee. This must be paid at least three business days prior to the visa interview, which will take place at the U.S. Consulate in your home country. Interview procedures also vary depending on the country, so it’s important to contact your Consulate or visit its website before your interview so you know what to expect. Once you receive your I-20 and pay the SEVIS fee, you should make an appointment at your Consulate to apply for a visa stamp. A visa is a permit to apply for entry to the United States and can only be issued at a U.S. Consulate outside the United States. 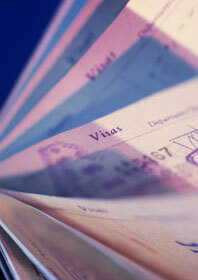 Processing times vary, so you should check well in advance in the city where you plan to file your visa application. The U.S. State Department has a helpful website where you can check the waiting time for an appointment and how long it will take to have the visa issued after the interview (http://travel.state.gov). The visa stamp can only be issued up to 120 days prior to the I-20 reporting date. Details can be found on the U.S. Consulate website (www.usembassy.gov). Further, you should have documentation to prove you have ties to your home country. To do this, you will want to submit evidence of economic, employment, or family ties through bank statements, tax returns, property deeds or titles, and any future employment opportunities in your home country. Once the visa application is approved, the stamp is placed on your passport. The name of the school and SEVIS ID number is noted on your visa too, as you are required to enroll in that institution upon your initial entry to the United States. Hopefully, the visa is approved. However, if it is not approved, you should request a denial letter, which explains the reasons for such a decision. The letter is helpful if you choose to reapply at a later time after gathering the documents and evidence needed to overturn the decision. It can be very difficult to overcome a denial, but it is necessary to be prepared for this possibility. Remember, you are only able to enter the United States up to 30 days prior to the I-20 start date. At the U.S. port of entry, you meet with a Customs and Border Protection officer. You are then authorized to stay as an F-1 student based on your I-94 card, a small, white card that is stapled in your passport. The I-94 card should be marked “F-1 D/S” for properly admitted F-1 students. You also need to check with your school to see how you should report your arrival, as different institutions have different policies and procedures. True, this process is long and rather complicated, but thousands of students master it annually and go on to successful academic careers in the United States. Just remember that you can be one of those thousands that navigate the murky seas of the F-1 visa application! These websites offer invaluable information on this process!